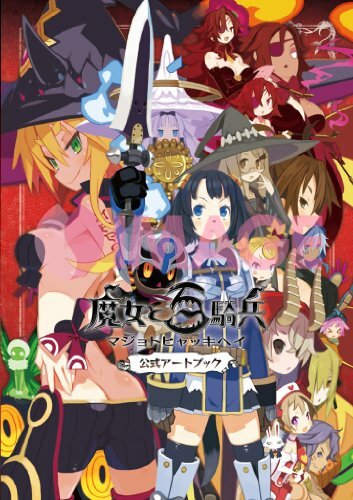 魔女と百騎兵 公式アートブック is the official artbook for the action role-playing game The Witch and the Hundred Knight that was released for the Playstation 3 in 2013. The character designs are from Takehito Harada who has also designed games like Disgaea, Prinny 1 & 2, Makai Kingdom and Phantom Brave. Takehito Harada has several artbooks and this one feels like his as well due to the art direction. The book is a large 178-page paperback. There are plenty of commentary but all in Japanese. Hopefully, this is one book that Udon will translate. The first 60 pages are the art gallery featuring splash art pages from Takehito Harada and other artists. You can see various artists' interpretation of the characters in their own style of drawing but they all use the similar bright anime-like colour palette. The illustrations are beautiful. I like the comic style drawing and colouring, and there are chibi versions also. The style of art is very typical of Japanese games that feature comic-like characters. The rest of the book features concept art such as character and creature designs, environment art, followed by an interview with the game director and more miscellaneous drawings. Each character is given a nice coverage. The characters are shown in various poses, facial expressions and costumes. There are plenty of commentary. The cutest character to me is the White Knight which is actually a short soldier with blacked out face with red concentric circles for eyes. The weapons he wields are larger than him so he looks quite comical. Creature designs are also quite nice to look at. They are fleshed out more compared to the human characters and come with more commentary. The environment artworks are beautiful also but could be bigger as they are squeezed three onto a page. For each environment, there's the final painting as used in the game plus a concept art thumbnail that looks almost the same as the large painting which makes me wonder why it's included. It's quite a nice video game art book. It can also be mistaken for Takehito Harada's personal artbook because of his very recognisable character designs, but that's just for the characters and not the creatures and environment art.